Frank Keating on County Cricket in The Guardian on 15th April. Those of us of a certain age (baby-boomers like me or even older, like Keating) have to cope with change and it isn’t always easy – especially when some new realities creep quietly up on you almost unnoticed and then become unavoidable truths. I am busy at the moment writing the biography of that great servant of County Cricket the estimable John Shepherd once of Kent and Gloucestershire. Researching Shep’s past and talking with him about it is reliving for me vivid memories of those distant days when the County Championship really did matter. But, as Frank Keating rightly says, it no longer does to any but a few diehards. And it is not just the Championship for which we will before long be saying the last rites – it is the whole anachronistic County system. Shorn up only by annual grants from the ECB the 18 (18!) counties muddle on from year to year pretending that they are credible sporting and business entities. They are not. There are too many counties and for most of them their only justification for existing at all is that they always have. Cricket in England has a rosy future – our grounds are full for Test matches and international limited overs matches and that is the cricket that really matters. 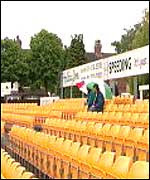 To support the development of young English-qualified talent to feed our national squad we need a small number of clubs (eight would seem about the right number) playing top level cricket (first-class and the shorter form of the game) in a financially secure structure - and playing matches that people actually want to see. The IPL has shown the way – the ECB must act soon.